The crazy wintery weather seems relentless this year. My kids have had so many snow days that I have lost track. Another snow day today! What to do with all this extra time at home? Well, when and if we have electricity, we have been busy cooking. Yesterday, we tried making homemade fudge. Although the flavor was fantastic, the texture was wrong wrong wrong. Apparently, I stirred it too soon. Ugh. Today, my daughter wanted to make Pinkalicious cupcakes. I used the recipe from this book. We were so excited to try them but alas, the cupcakes were very mediocre at best. We rated them a 4 on a scale from 1 to 10. I should have known we were in trouble when the recipe for 16 cupcakes was enough for 32 cupcakes. Well, it was a fun baking day, and we had been wanting to make them for a while. And so, I’m kinda of in need of a small break from the kitchen. It happens. 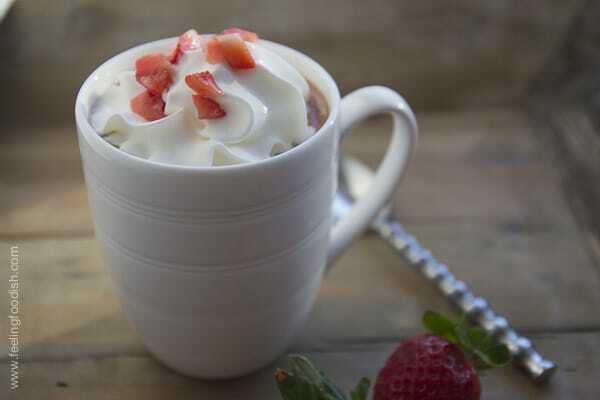 Still wanting to make something quick, healthy and naturally sweet for Valentines day, I thought of creating a “chocolate covered strawberry” hot chocolate because, ya know, I’ve been ogling those chocolate strawberries in the grocery store this week, but….no sugar for me. Well, at least today. I’m trying, and it’s NOT easy. And so to make a sugar-free version of this hot beverage, I used Truvia. But you can use the sweetener and milk of your choice. 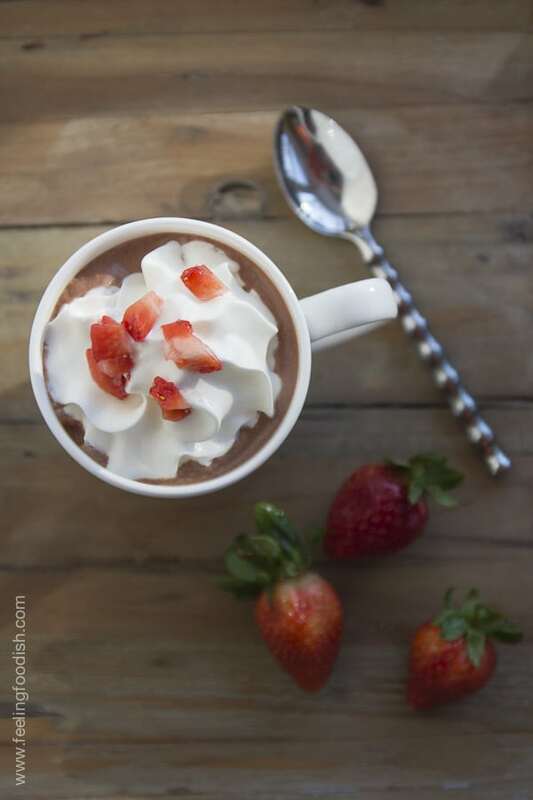 My version uses almond milk, Truvia, fresh strawberries, and cocoa powder – yum! Add strawberries, cocoa, sweetener, and almond milk to blender. If you own a Vitamix, you can continue blending for a minute or 2 until the mixture is hot; otherwise, transfer to a small sauce pan and heat over medium heat until hot. 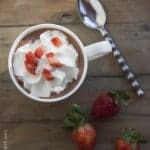 Top with whipped cream and diced strawberries if desired. It’s no secret that I love mojitos. 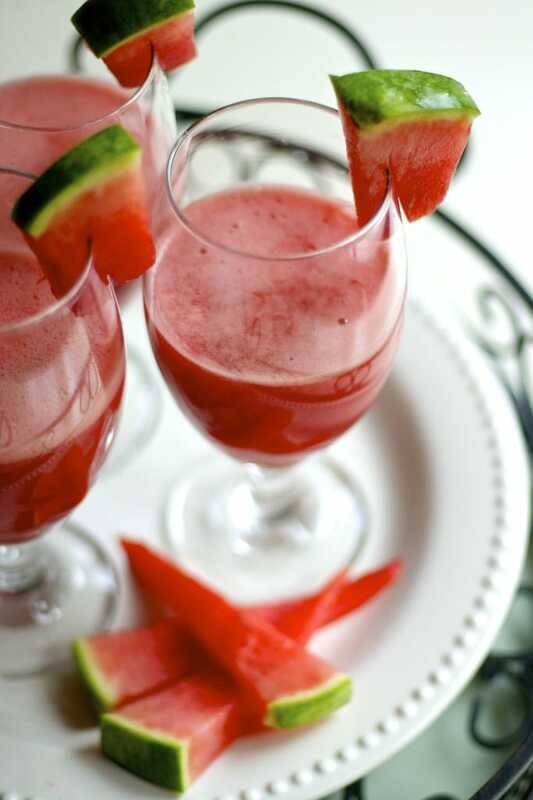 Traditionally thought of as a summer drink, this version is a twist for the holidays or anytime, really, in my book. This mojito reminds me of my summer trip to Miami Beach. We went to the Fountaineblue Resort, and I had a fantastic, out-of-this-world-good blueberry mojito. In a tall glass, just like this one. But it’s not summertime anymore. And, although I love many aspects of winter in this part of the country (Philadelphia area), I think we could all use a little reminder of the warmer weather at times, and so why not? 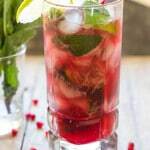 Drink a mojito! 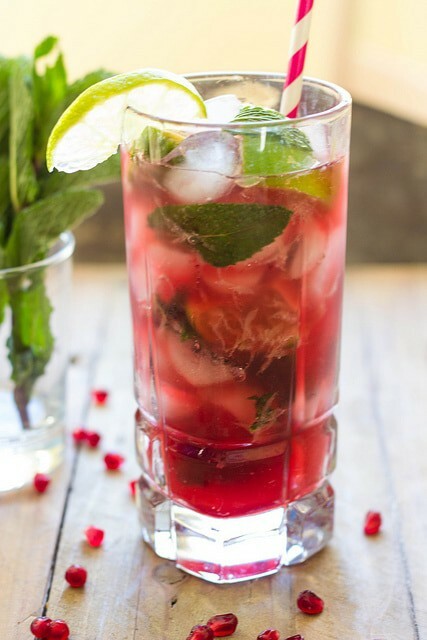 I love the colors of this mojito around this time of year. 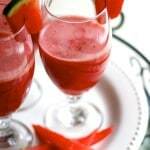 This drink is very simple to mix and you can opt to make 2 smaller drinks instead of the tall version pictured. I’ve been drinking greens smoothies for a while now. My “usual” has always been spinach, apples, celery, cucumber and lemon. This time, I wanted to change things up a little for two reasons: I wanted a different flavor, and I wanted to add protein without using a protein powder. After a few days of enjoying “PBO” smoothies (peanut butter, banana, oatmeal smoothies), I thought I’d combine the peanut butter thing with the green smoothie thing. 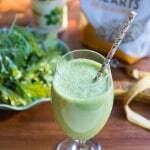 And you know, the peanut butter and banana totally masks the taste of the greens. Trust me on this one, okay? If you want to be safe, just double the amount of PB2 and you’ll be in peanut butter heaven. Have you heard of PB2? It’s powdered peanut butter, which contains only 45 calories in 2 tablespoons compared to just under 200 calories for regular peanut butter. What a big difference! 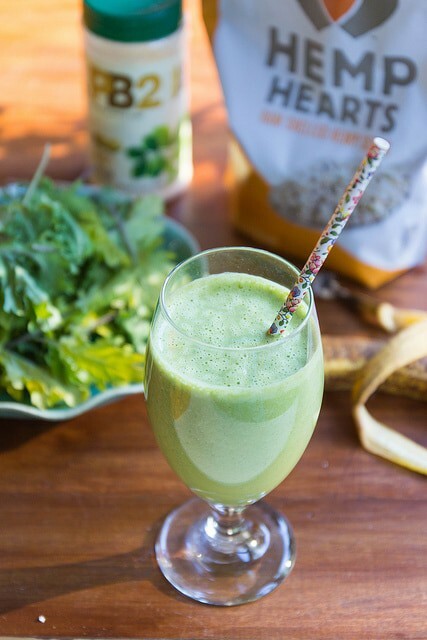 The other product that works well in this smoothie is hemp hearts. I got my hemp hearts (shelled hemp seeds) at Costco. This is my first time eating them, and I’m loving them. In addition to providing tons of plant-based protein (which contains all the essential amino acids! 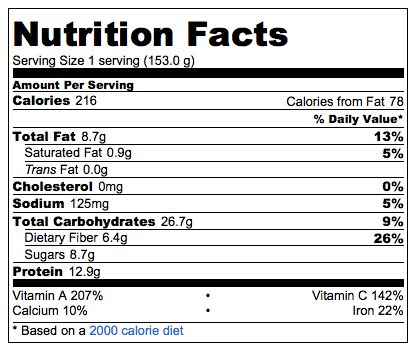 ), they also provide a good balance of omega 3 to omega 6 fats. So forget the fish oil pills (bleck!). And, they taste a lot like sesame seeds to me. Don’t forget to check out the nutrition facts below – almost 13 grams of protein in this little drink with tons of vitamin A and C. Also packed with fiber (over 6 grams), and only 200 calories. Years ago, my girlfriends and I went out for dinner in the city. We still get together every now and then, but it’s become more and more difficult as our families grow and we all get busier. 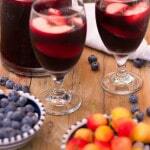 A fun time is usually had by all, but on this particular night, it’s the sangria that stood out. All these years later, I still remember it! It was so unique, a hint of blueberry and a wonderful note of cinnamon. I’ve tried to make it before, but I kept striking out. Then it hit me: use cinnamon sticks not powder! Duh! As you might imagine, the cinnamon powder did not incorporate well into the alcohol mixture. This time, I made a simple syrup with the sugar and blueberries and incorporated a few cinnamon sticks to the mix. Bingo! There was the wonderful cinnamon aroma that I loved. 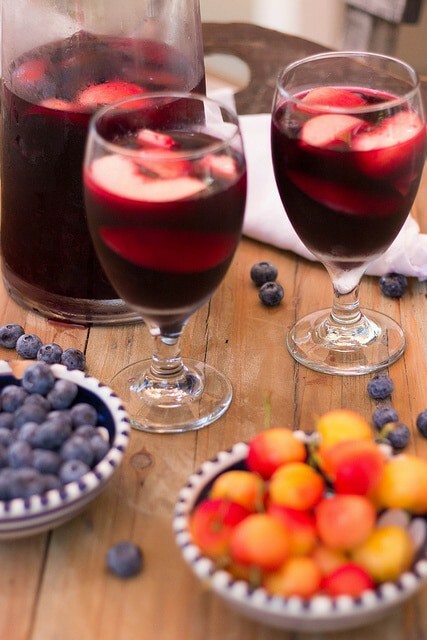 I’ve read that true sangria should never include vodka and that brandy or whiskey should be used, so feel free to substitute the vodka in my recipe if you wish. I think the true essence of this recipe comes from the blueberry syrup anyway, which is infused with the cinnamon. Garnish with additional cinnamon sticks if desired.